In the beer industry, just like with any industry, can be highly influenced by fads. Fads unfortunately affect everything, and in a way is a form of control. In some cases though, fads can be slightly beneficial. Case in point: Don’t like avocados? Well, there was a fad that made them the new power food. Wanna know what make-up to wear? Apparently Kim Kardashian-West wore some pretty affordable lipstick and make-up for her wedding. Looking for a new beer to try? Just check the trending beers, or whats on tap at most “good” bars that serve craft beer and you will find the I.P.A. Believe me I have my own rants an opinions on fads, but as a valued reader, I will save those for another day… or not at all. I will stick to the I.P.A world. In recent years I.P.A’s have been surging through the market with increasing intensity. And with the constant competition in the market, many brewers have jumped on the bandwagon like Samuel Adams (not saying that’s a bad thing). However, with the constant influx of I.P.A’s, flooding the market it can be overwhelming to the average consumer. So today we will talk a little about it’s history, some brewers who have made them popular, and some suggestions to try. If you only take one thing away from this article, just remember not all I.P.A’s are the same and just try different brands until you find one you can appreciate and enjoy. What is an I.P.A anyway? Is it a new thing? Will it destroy my mouth? How is it best served? All valid questions. Let’s begin. There are many rumors and theories as to how I.P.A’s got their start. In fact, I too was subjected to one of those. Maybe you have heard of this one: While India was under British control, the troops were awaiting their precious cargo – Beer! Specifically pale ale from the U.K. Through the bustling harbor, in comes a British Cargo ship. The porters rush to the docks, drooling at the succulent ale to be bequeathed to them. To share and enjoy amongst themselves as well as their parched military peers. The barrels get brought in and tapped, freeing that liquid treasure from it’s wooden prison barrel. Only to be gulped and spat out because it was skunked after the four month journey and rather unsightly storage conditions. So the brilliant brewers back in good old Mum’s country decided “By Jove, the bloody hops must be increased to help preserve the beer.” Which then lead to a distinct flavor profile of an increase of a bitter flavor. Thus the birth of the I.P.A. While a neat history to a popular beer, the fact of the matter is, yes hops were discovered to preserve the life of the beer naturally, the rest of the story grew more fanciful over time. For a more detailed history of the I.P.A I highly recommend reading http://zythophile.wordpress.com/2011/08/04/four-ipa-myths-that-need-to-be-stamped-out-for-ipaday/ or http://zythophile.wordpress.com/2010/03/31/ipa-the-executive-summary/. Basically what it boils down to (see what I did there), Ale/Beer was part of the export to India, and not all of it was “overly hopped.” Hops are a natural preservative and were used to help beer last longer journeys,especially India. After sometime in the early 19th century, these Pale Ale’s picked up popularity and the nick name India Style Pale Ale stuck, or at lease became used by marketers to serve a new product. As mentioned previously, with the help of the I.P.A Fad in recent years, these beers have increased in popularity. There are some brewers who seem to be at a competition on how much hops they can put in their beer before your tasted buds give out and your tongue dies. It’s a lot like who can make the hottest hot sauce. Only the manly men, or women, can handle this sauce! It’s the same with some I.P.A’s. Mind you an I.P.A is one of my preferred and favorite Ales, but there comes a point where you want to enjoy the full body of the beverage and not feel like your mouth got into brawl with a tiny Jet Li. Don’t get me wrong, sometimes it’s fun to just enjoy the kick in the teeth, as you would a ghost pepper salsa or habanero barbecue sauce. But this isn’t an all the time thing, I.P.A’s offer a variety of complexity, not only in aroma but in flavor, consistency and color. I just tried a deliciously balanced I.P.A the other day, in fact. The name: Leather Lips. The brewer: The Tap, Haverhill, MA. As an example, when I first smelled this Ale, it gave an effervescent sweet almost candy-like scent. When I took my first sip, there was an immediate caramel-like sweetness, from the Centennial hop, but there was a presence of a dry bitterness that bathed my tongue; especially in the rear sides of the palate. It reminds you it’s an I.P.A, but leaves you feeling refreshed and not like your sense of taste has been attacked. And that’s really what I.P.A’s can offer. Their aromas can range from sweet to citrous-like, to an almost floral scent. There are Dark or Black I.P.A’s (bit of an oxymoron, a Black “Pale” ale), where the malts are roasted. These can have a more earthy note, and compliment the beverage as a whole. Some can even taste like a Porter or a Stout, with a bit of hop bitterness added almost like a “garnish” to the flavor. Also, some regions have made hopping a beer such an art that you know when you drink one its from the West Coast of the USA (Sierra Nevada, Stone, etc). Or some might even be able to pinpoint the specific brewery without even looking at the label. So if this is a style you are afraid of, or have even had a bad experience with, just keep trying. Put two I.P.A’s next to each other, from two separate breweries, and though they both state its an India Pale Ale, each can taste completely different. Below I have listed a couple that I was impressed with, and feel might be just mellow enough to get started on or would be enjoyable for any hophead out there. This brew I found to be satisfying. Well balanced hop and flavor profile. Slightly earthy with a soft mouth feel. This would be a GREAT introduction to I.P.A’s in my book. 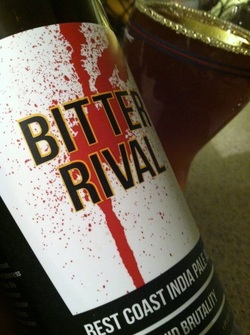 “Brewed like a west coast style IPA with a heinous amount of Columbus, Amarillo and Chinook. A heavy-handed focus on bitterness is what this one is all about. 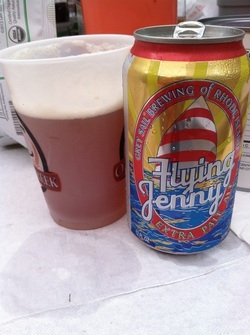 We named this brew in honor our boundless disdain for a particular hockey club in Montreal. Hops and hockey and both better when they’re bitter. It’s science. Unfortunately I Had a defective bottle so no carbonation. That meant little to no nose, so we had to be creative when trying it. Even though it was flat, it had a malty bitterness, with a complimentary sweetness. If it was this tasty without carbonation I can only imagine what it would be like with. 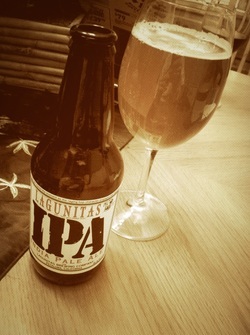 “Lagunitas IPA was our first seasonal way back in 1995. The recipe was formulated with malt and hops working together to balance it all out on your ‘buds so you can knock back more than one without wearing yourself out. Big on the aroma with a hoppy-sweet finish that’ll leave you wantin’ another sip. It might be a little much for a newcomer to the I.P.A world. It’s crisp, and has a blast of citrousy hoppiness when you sniff it. But it really doesn’t destroy your mouth; it’s the epitome of West Coast IPA. 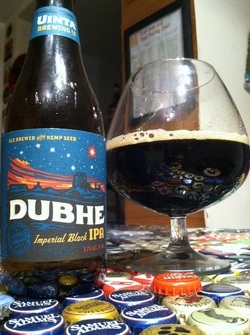 “Toasted, chocolaty dark malts align with an astronomical amount of hops. Named Utah’s Centennial Star in 1996, Dubhe (pronounced Doo-bee) illuminates the front of the big dipper from 124 light years away. Dubhe, also known as Alpha Ursae Majoris, is a red giant that appears orange in color and has a mass 4x that of the sun. 9.2% ABV 109 IBU”For the ABV it is not boozy, however, there is pleasant warmness going down. I found it to have a rich hoppy nose; surprisingly that’s where all the bite comes form. It had a very mellow with dry finish. The would be a great introduction to the I.P.A world.